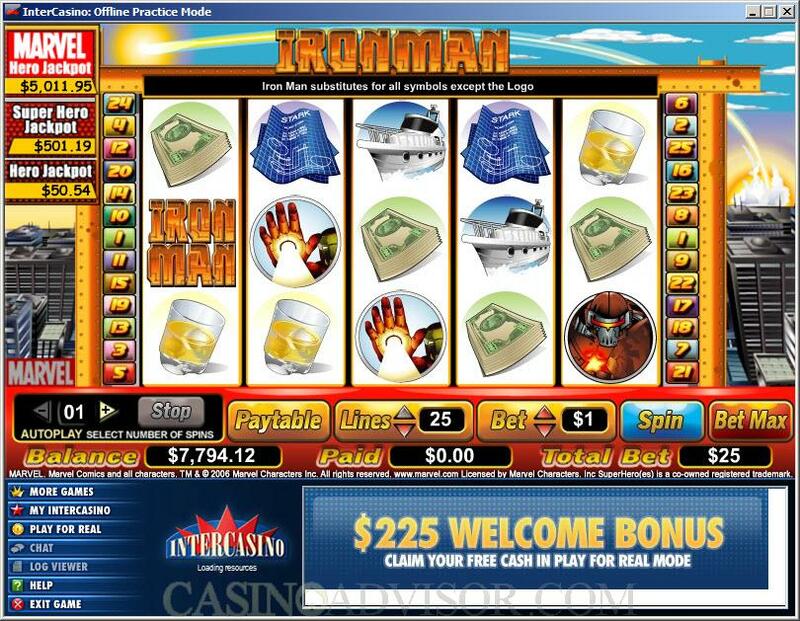 Iron Man belongs to the Marvel Jackpot Slots series of Cryptologic that are based on Marvel Comics superheroes. Iron Man has become a superhero because of his armor, which makes him invulnerable and gives him super human powers like the ability to fly. The symbols on the reels tell the story of Iron Man. The wild symbol is Iron Man himself. Tony Stark is Iron Man’s real identity. Stark is a genius inventor and the owner of Stark Enterprises, whose office and yacht also figure on the reels. Then there are two enemies of Iron Man, Crimson Dynamo and Justin Hammer. Iron Man’s hand is also a symbol from where he can fire laser beams. When in pain only alcohol can provide relief to Iron Man and therefore it is also a symbol. The other important symbol is the blue print, which is what Iron Man is looking for in this game. The Iron Man logo is the scatter symbol. 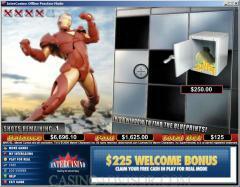 Iron Man is a 5 reel 25 payline video slot that allows only one coin to be wagered per payline. The number of paylines can be adjusted using the UP and DOWN arrows next to the payline indicator. 25 paylines can be enabled by clicking on the Bet Max Button. The slot game has a wide coin denomination range. The allowed denominations are 0.01, 0.02, 0.05, 0.10, 0.25, 0.50, 1.00, 2.00 and 5.00. The coin denomination can be selected by using the UP and DOWN arrows next to the denomination indicator. 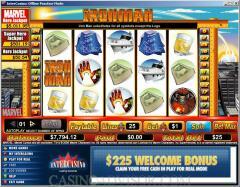 Iron Man is the wild symbol and offers the highest fixed jackpot of 6000 coins. It does not multiply payouts. The Iron Man logo is the scatter symbol. Two or more of these symbols offer a scatter payout. Three or more scatter symbols trigger the Iron Man feature, which is a bonus game on the second screen. Iron Man hovers outside a building in search of blueprints. The player selects five out of nine windows in turn, which Iron Man smashes using his laser beam. If there are no blueprints in a window the player wins a consolation amount. However if the Iron Man finds the blueprints the player wins up to 250x the triggering bet. Iron Man subscribes to the unique progressive jackpot network of Cryptologic’s Marvel Slots. This is a three level jackpot. The largest of the jackpots is the Marvel Hero jackpot, which starts at 5000. The second largest is the Super Hero jackpot, which starts at 500. The third largest is the Hero jackpot, which starts at 50. The three jackpots function independently and can be hit independently. Another unique feature of these jackpots is that they are hit randomly. No sequence of symbols is required on the reels in order to hit the jackpots. However, the larger the wager the greater is the likelihood of hitting the jackpot. Interested in reading more detailed information about Iron Man? If so Click Here for more details.